In a world where finding out how to filet a fish or write a novel in under a hundred days is as easy as tapping into Google's infinite database from a cell phone, it's easy to forget where this enormous stockpile of know-how comes from. Enter Ignite Sebastopol, a friendly reminder of the weird, wacky and waywardly random bits and pieces of savoir faire that the good folks of Sonoma County have to offer. Here's the premise: Participants are given five minutes to gab about their passion. Subjects at past events have ranged from the best way to buy a car to the ins and outs of cyborg anthropology—meaning just about everything is fair game. 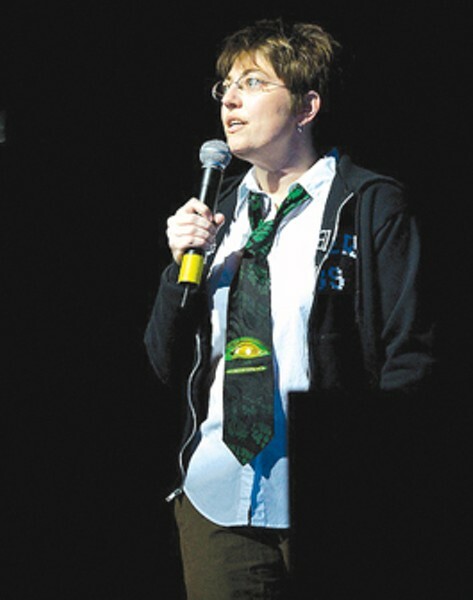 (Above, "surly media nerd" Annalee Newitz discusses in a previous Ignite event whatever it is that surly media nerds talk about.) A hybrid of game show and slam poetry, Ignite is a real, live search-engine grab bag. Ignite Sebastopol is hosted by O'Reilly Media, the Sebastopol-based company that coined the phrase "web 2.0" and which evinces a desire to spread the word on technological innovations from all over the world. A fatherly figure in the tech realm since 1978, O'Reilly Media has been sponsoring Ignite events across the globe since its Seattle debut in 2006. Sara Winge, vice president of O'Reilly's Sebastopol office, says Ignite, the brainchild of two Seattle techies, was born out of a need for a closer community. "It's a great opportunity for people to do a talk about whatever lights them up," Winge says. "I think we all get inspired and energized by seeing what other people are passionate about." She adds that this year is already shaping up to have a distinct Sonoma County flavor, with many presentations exhibiting the region's famous environmental streak. "The presentations are just so all over the place," Winge says, recalling past years. "And the event really isn't about O'Reilly at all. Most of the events are hosted by community members in the locations, so it's really a very grass-roots event." Those who are just dying to share a helpful tidbit of advice or perhaps roast the recent developments on Proposition 8 should visit http:-/ignite.oreilly.com for more information. Ignite Sebastopol is slated for Wednesday, June 10, at Hopmonk Tavern, 230 Petaluma Ave., Sebastopol. 6pm. Free, but reservations are recommended. 707.827.7109.